Spain’s anti-eviction activist group PAH (Plataforma de Afectados por la Hipoteca, ‘Platform of Those Impacted by the Mortgage Crisis’) today launched a week of events, rallies and protests in Barcelona, designed to raise public awareness about the ongoing evictions of renters and homeowners behind on their mortgage payments in Spain’s second largest city. The week of activities will turn on several protest rallies in solidarity with families recently evicted from their homes in the Clot neighborhood of Barcelona (see video, below). Meetings with student groups and neighborhood associations working to halt the evictions are also scheduled, with a full agenda available on the PAH-Barcelona website. More than 2,951 flats were left vacant in Barcelona following the 2008 mortage crisis in Spain and the anti-eviction group has been a principal force in driving the city of Barcelona to attempt to force banks holding mortgages to make more of those vacant properties available as affordable housing. 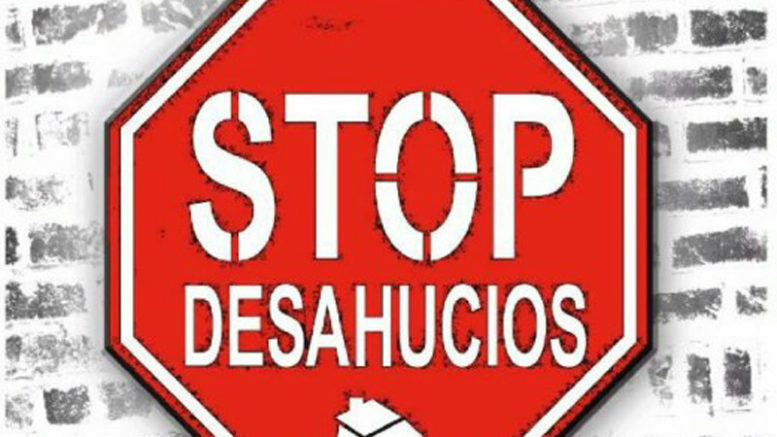 During last year’s general elections in Spain, the PAH advocated that political leaders sign-on to a five-point plan that called for homeowners in arrears to be able to catch up on their mortgage payments retroactively, affordable rental housing, an immediate halt to evictions of families for non-payment of mortgages or rent, a sufficient inventory of public housing to help those families already evicted, and public assistance with payment of electric bills for those families in need.